With hypertransparency you get a society of chameleons and octopi. 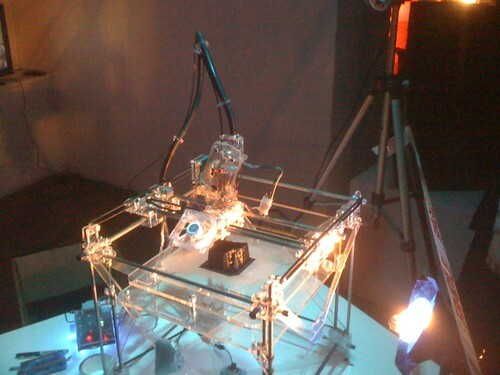 I have been involved in open source projects, then open hardware projects, now I am trying my hand at open artware. I just give my sketchbook out to willing hands with some material ( it has mostly been mechanical pencil, charcoal and calligraphy pen) and ask for a contribution. Sometime willing hands find my book lying unattended in a public place and ninja in some contribution ( others would derisively call it graffiti, but I like graffiti). I have run the project in bars, clubs, at MONA and even in my colleague's office in Canberra. Thank you all for willingly contributing to make my blank white pages interesting. I am not aiming to curate, the sample here is merely the first contributions rather than any qualitative measure - art is a subjective personal matter after all. I wish drunk and drugged people in Salamanca late on weekend nights would let me be who I am and not harass me for my skin colour. Last week was an amazing overload of gadgets (with some flying to Canberra and hanging out at a bar with E-Tax release manager thrown in). First highlight was the Octocopter at UTAS - it is indeed a massive beast with 8kg border line payload, paltry 5 minute endurance, but it gets the kit off the ground. I also saw some of the amazing work Arko has been doing with Bundler, PMVS and Meshlab. The night before I went to Canberra, there was a Sound2Lights show in the Long Gallery with lots of cool gadgets. Including the aforementioned Rep-rap extruder printing out music (Joseph) , a Kinect you had to do a weird dance to get to put words in place (and possibly rhyme and form poetry - Aaron) and of course Nick's game of life with music controlling organisms rendered in Unity 3D. Thursday early in the morning I flew off to Canberra to help deploy Australia wide terrain, but that is another story. Lately I have been hopping around the world sketching a lot of things I see. I only got told off, actually mildly reprimanded for doing so yesterday at the Henry Jones art hotel. 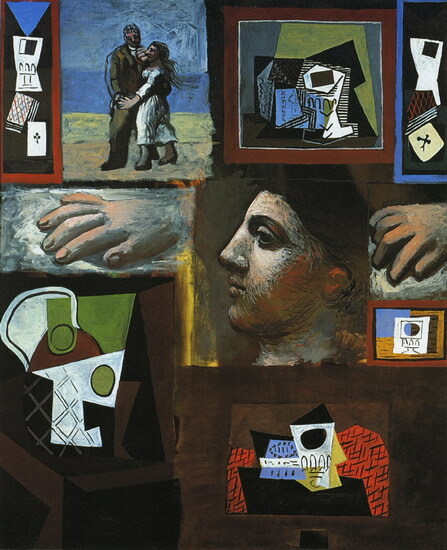 I have been practicing what I can best describe as meta-art or referential art (without repeating all of the title of this post), like this Picasso piece titled etudes. The work at the art hotel is on display for sale purposes and sketching them steals their soul and reduces value. 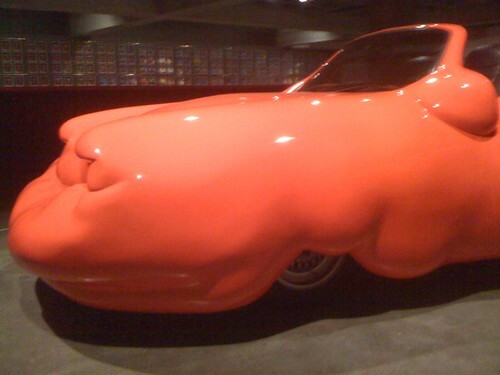 At least MONA does not suffer from such constraints and I happily reproduced different views of the fat car, plastic enhanced Porsche in pencil, together with glimpses of the surrounding material and carbon-dioxide sensors. On the ferry back I ran into some very nosy Hobartian who have been snooping on our conversations at Dr. Coffee, but such are the charms of a small town. Now I know who to watch out for when expounding on the joys of Navier-Stokes. On Wednesday last week I managed to visit Emmanuel and get a guided tour of Googleplex. Patrick dropped me off and asked him to take good care of me. I got free lunch and free dinner - I consider that very good care. The visitor registration screen asked if you were from Sudan(s), since sometime last month there is no more Sudan. The registration text needed updating. The glass elevator needs to have the ability to play through time, so that I can show the Southern Surveyor arriving and leaving the docks outside work and the snow levels shifting on Mt. Wellington. I would also like it to have a roof and a floor (whatnick pavement view to be released soon) and seamlessly transition into streetview. We then drifted off into philosophical discussions about software and refactoring being somewhat similar to Mandala's. Make it - learn about it - throw it away - do it again. The stroll down from Googleplex to the Mountain View Wetlands is great for taking in the squirrels and owls along with other wetland birds. After the walk, we finished off the evening with stacks of crepe and conversation. The little boy seems to like the "Sterling Dervish" from Forkometry which is a good sign. Monday, 1st of August 2011, I officially signed in as a NASA visitor. Patrick gave me a grand tour of the place. Since photography would get us into trouble in most of the places I resorted to sketching things up. First stop was the Vertical Motion Simulator, which was simulating a VTOL aircraft (tilt-rotor) when we got there. We saw Hangar one (big blimp hangar), the uber Wind tunnel with hockey playing equipment strewn in front of it. We then discussed the past, present and future of WorldWind, Globe viewing client, scalable + distributed data serving, porting to Android platforms and much much more. We finally had a small timeslot to catch up with Mars Rover software team, heavy users of the Ardor3D Java based game engine. I have been building OSGi manifests into Ardor3D and I was preaching the use of the manifest enabled jars in their projects - Antares and Verve. I also discussed the differences between Clipmapped terrain (as in Ardor3d) and Chunked LOD (as in WorldWind) with Leslie and how we can merge the 2 techniques for large terrain rendering to make something scalable, accurate and aesthetically pleasing. Day two I sat in on one of the WorldWind team telecons and got wind of the developments on Android and challenges of a multitouch interface user semantics, as well as scalability required to proxy and deploy Microsoft Virtual Earth datasets. On Friday I had a joint showing with Bruce from Emxsys and caught up with Vince Ambrosia and team from the WRAP project. We discussed coupled fire models (terrain + fuel + wind + fire) and UAV derived information assimilation for training and operational fire fighting purposes. Another show-n-tell in NASA hangars followed (including ogling at Google Jets parked in there). We saw the mostly moulded carbon fibre hull SIERRA and discussed air-space management during fires to allow use of UAV's. Over all it was a highly enlightening trip. One I would like to repeat as soon as possible. The last few days in Mountain View have been full of chance encounters. I better jot them down before they fade from memory. I walked into the US, literally, at Vancouver airport. The passport got stamped by US Customs and bits of Vancouver airport are technically US territory. On the flight I sat next to a lady (librarian) with sons in Stanford and Twitter. Interesting discussions ensued regarding DNA untwisting and social sensing via Twitter. I caught a cab-ride from SFO to my hotel in Mountain View and promptly fell asleep. Saturday I visited the NASA AMES' open to public show case and drowned in a sea of high-schoolers visiting under the SMASH umbrella. I listened to a bit of a talk on SOFIA - air-borne telescope. I piped up about seeing infrared with mobile phones and open source at NASA (in response to a student question). This earned me a new label - "mysterious stranger". I strolled down Moffett Blvd towards Castro hunting for some dinner. A couple rode past on bikes and they were rather offended when I said I didn't know who they were (apparently local TV personalities). I was looking lost at a set of traffic lights and the Mac Outlook lead walked past with his wife and guided me. 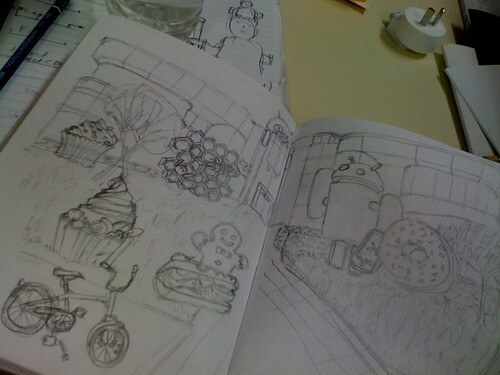 Some more dining and penciling in what I saw followed. Sunday I took a trip to the end-of-line in VTA light rail, all the way to Almaden. Then tramped a few more miles to the old Almaden Vineyard site (now a bunch of houses), this was apparently California's first winery. I acquired some charcoal for drawing along the way and made another chance stop at the house of some kids I had met on the train to refill my water bottle. Almaden trip was rounded off by a scramble along the rocky edge of Almaden Lake. The hopped off the return train to Downtown Mountain View and went into the wine bar at the station. I was trying out my newly acquired charcoal on some wine racks and a chandelier, when an ex-Lockheed employee walked in and talked about his work on the batteries on the Hubble space telescope. So a rendition of Hubble and his name got attached to couple of pages filled with wine racks. On Monday I visited Patrick and couple of people from the Mars Rover team at NASA, but that is another post. No chance encounter took place.